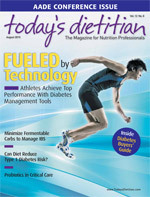 Dietitians, especially those who own private practices, are always looking for new opportunities to grow their business. Today’s RDs offer myriad diet-related services to help improve their clients’ overall well-being, and one growing service area is diagnostic testing for food allergies and intolerances. Supplee has taken specialized training through Signet Diagnostic Corp to become certified in the Lifestyle Eating and Performance (LEAP) dietary protocol. She also administers the Mediator Release Test (MRT) blood testing as part of that training. She often works in tandem with a client’s primary care provider to order the test and then administers the dietary counseling accordingly. Not surprisingly, there is a huge void between receiving the results of allergy testing and a patient’s next trip to the supermarket. When RD Lori Langer’s son had IgE-mediated/type 1 food allergy testing done 13 years ago, she left the allergist’s office with the knowledge that he was allergic to six of the top eight most prevalent food allergens. “The trip to the supermarket that followed took hours and was overwhelming, even for a dietitian,” says Langer, RD, MEd, CLT, LDN. “Those of us who care for those with food allergies know that when a person is allergic to a single item, in reality, one must check ingredient labels for possibly 100 different ingredients that may be derived from that one food. Now multiply that by several allergens and the task of grocery shopping for an allergic individual can be overwhelming, not to mention cooking the food. A few companies offer programs for dietitians, the most popular being the LEAP program offered by Signet Diagnostic as a self-study program for dietitians to become certified. The didactic part of the program is on CD. Once they complete the home-study part, students need to pass a comprehensive exam to become LEAP certified. Once certified, these dietitians can provide their patients with the opportunity for food-sensitivity testing. The test is the MRT, which is for non–IgE-mediated reactions that are delayed and immune based. “It is primarily used for patients who have irritable bowel [syndrome (IBS)], fibromyalgia, and migraines, although patients with other symptoms suspected to be triggered by foods may consider having the test done,” Indorato says. Langer became a certified LEAP therapist last fall and helps guide her patients through a customized diet plan to meet their individual needs. As Diana Bright, MS, RD, CCN, CLT, explains, another diagnostic test RDs and physicians use is the Enzyme-Linked Immunosorbent Assay, commonly known as ELISA, which tends to focus on a specific immune pathway such as IgG/IgE. • IgG only plays a minor role in IBS, migraines, and fibromyalgia. Instead, research shows that type 4 hypersensitivity is the primary type of reaction. Type 4 hypersensitivity doesn’t involve IgG or any other antibodies. When Jan Patenaude, RD, CLT, a consultant and director of medical nutrition at Signet Diagnostic, started providing MRT and LEAP protocols, the testing was still quite new, but she quickly realized the results of her efforts. “I saw amazing results in clients—clients who had ‘been there, done that’ regarding physicians, meds, diet changes, diet consults; clients who had nearly given up hope [of] ever finding an answer to their migraines or IBS or arthritis pain or fibromyalgia,” she says. Patenaude started spreading the word, since it was the most exciting, rewarding, challenging, and interesting work she’d ever done as an RD. And Patenaude is not alone. Supplee believes that the more RDs understand food reactions for their clients, whether allergy, sensitivity, or intolerance, the better care they will provide.